Author Alan Crisp, an NSR analyst based in Hong Kong, writes that there has been much discussion of late on the topic of precision GPS—the ability to use M2M/IoT and big data in order to lower the costs of agribusiness, increase crop yields, and ultimately being able to feed a growing world population. With limited cellular coverage pointing to a seemingly perfect fit for satellite in rural areas, what role will satellite play in the growth of the ‘digital farm’? NSR’s M2M and IoT via Satellite, 7th Edition includes analysis on the agricultural M2M and IoT via satellite market, and found that in-service M2M units will more than double, increasing from 46,000 units to 102,000 from 2015 to 2025. During this period, ARPUs will grow by over 110 percent, reflecting the greater amount of data required for precision Agriculture, despite capacity pricing declines over the same period. Bandwidth requirements will increase significantly, from a few kilobytes of data to many megabytes, and potentially hundreds of megabytes depending on how detailed customer demand requirements are. 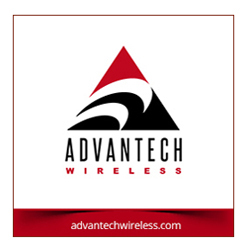 Higher bandwidth satellite M2M networks will be required to backhaul the increasingly larger data requirements. Next generation L-band networks are in prime position due to lower cost terminals and portability, as well as integration potential. Partnerships with agricultural equipment manufacturers will also be key to expanding market share for operators, as is important to recognize an increasing number of in-service units are being driven by traditional hardware manufacturers of agricultural equipment. The European parliament estimates 70 to 80 percent of new farm equipment sold today has some form of Precision Farming component inside. These include companies such as John Deere (partnered with Orbcomm) and CLAAS, which will grow the number of OEM installs in farming equipment such as forklifts, tractors and dozers—similar in some ways as to how satellite radio grew its market by OEM installs in cars. This will be required for precision Agriculture to be most advantageous to agribusiness—incorporating sensor data from the connected tractor to the connected cow. Lower hardware costs are critical, with a large installation of sensor arrays needed to realise the benefits of precision farming. Such costs have traditionally been a major restraint for farmers, especially owner-operator farms, and can add up easily for those with significant livestock and/or a large property size. NSR expects lower hardware costs to be achieved through deployment of Low Power Wide Area Networks (LPWAN). A number of companies such as Inmarsat are forming partnerships to bridge this gap by offering LPWA networks, either across regional areas, or as a single base station for a single farming property, and then backhauled via satellite. 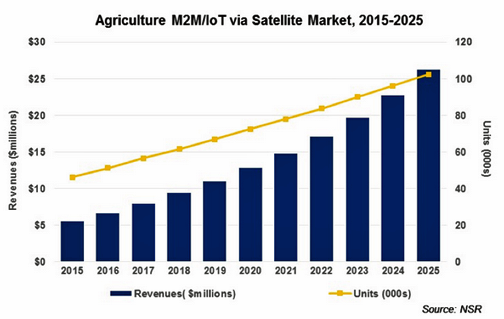 Put together, modest growth opportunities present themselves in Agriculture, but even with hitting these targets, Agriculture remains a relatively small niche in terms of satellite M2M and IoT demand. This is dwarfed by applications such as Land Transport, Maritime, and Aeronautical. Nonetheless moving forward, the inclusion of precision GPS technologies will be critical to growing market share in Agriculture, with limited new units for ‘legacy’ agricultural M2M expected to be sold in the coming years. Further, migration of existing customers to precision GPS solutions will further grow revenues. Even with the above requirements in place, there is no guarantee of a “slam dunk” for satellite operators. Despite the benefits that precision GPS has for agribusiness operators, the investment required by end users can be substantial, which adds resistance to establishing signing up new customers. For this market to become larger and worth investing in from a satellite M2M perspective, significant levels of government subsidies will be required to kick-start the market to much larger growth, in addition to significant growth in retail distribution channels to reach rural customers.